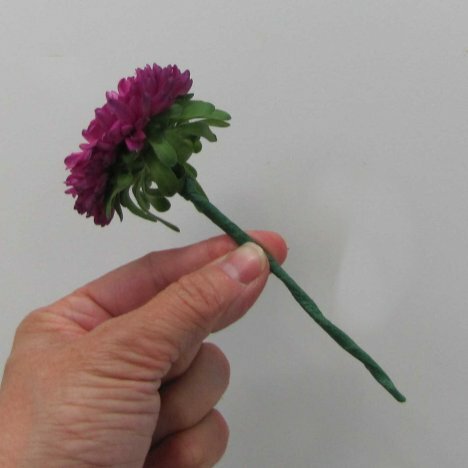 A unique boutonniere is so much more than a single flower pinned to a lapel. Taking time for extra details is what makes professional designs so pricy! 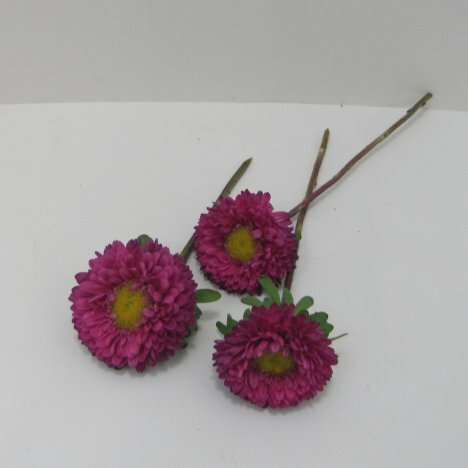 When you make a boutonniere from a Matsumoto Aster (also commonly called a "China Aster") you need to understand the nature of the flower. 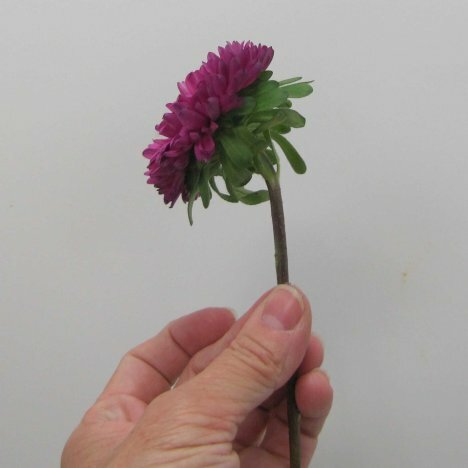 The flower head has a natural droop ("bent neck") that is characteristic of this variety. It doesn't mean the the flower is wilted. 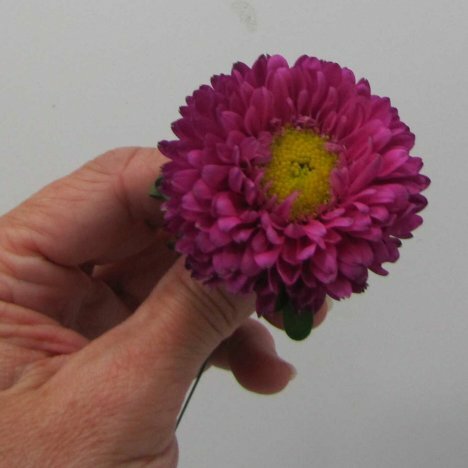 This means that the flower head is facing forward, even without wiring. 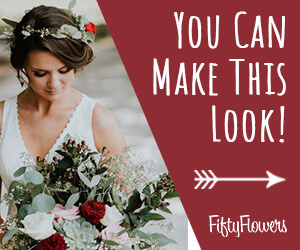 You can tell from my other boutonniere tutorials that I like wiring and taping flowers in order to bend and tilt the flower heads in the direction I want them to go. Even though this flower has the natural inclination to face forward, I still take the time to support the stem with a 26 gauge florist wire. I wire to ensure that the flower heads stay attached, as flowers under stress (like hugging people at a wedding) can have the annoying habit of snapping off at an inopportune time. Wiring helps prevent that possibility. 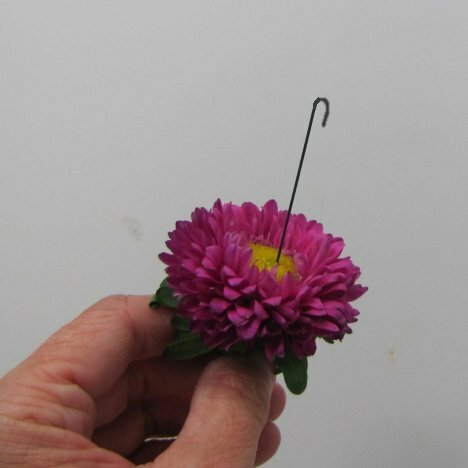 Insert the wire from the underside, bend into a hairpin hook and pull down gently until the hook is buried in the center of the flower. Pull in deep enough that you don't see the wire. 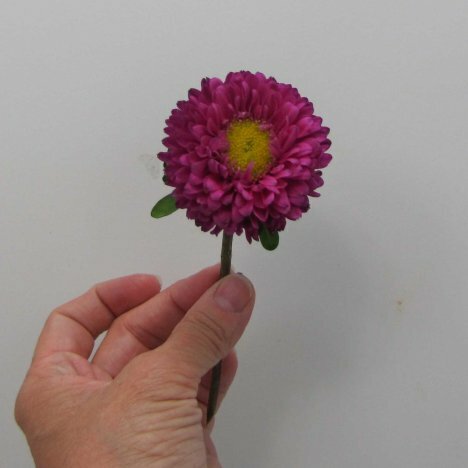 Tape down the stem of the aster, concealing the wire that is parallel to the stem. 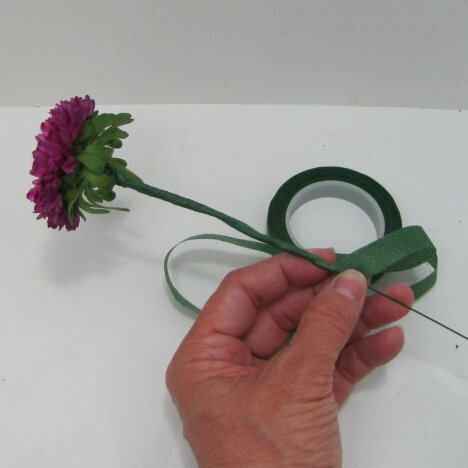 Pull the florist tape gently as you turn the flower, then snip off down at the bottom and give the tape another tight twist to be secure that no sharp edge is showing. 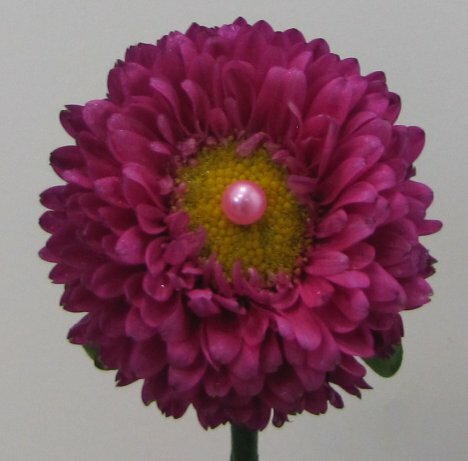 I'm going to shorten some standard 2" pearl corsage pins to use as accents for this unique boutonniere. 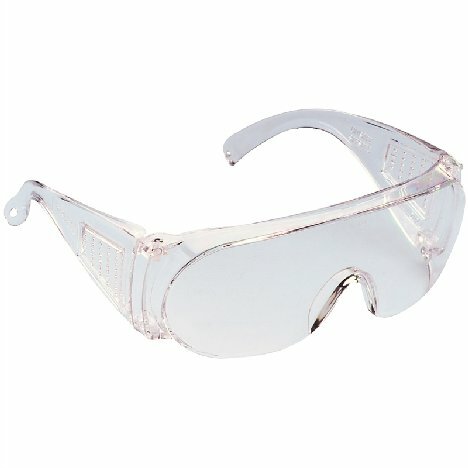 Always start with eye protection. Clipping off steel shanks can be dangerous if they go flying off into space. 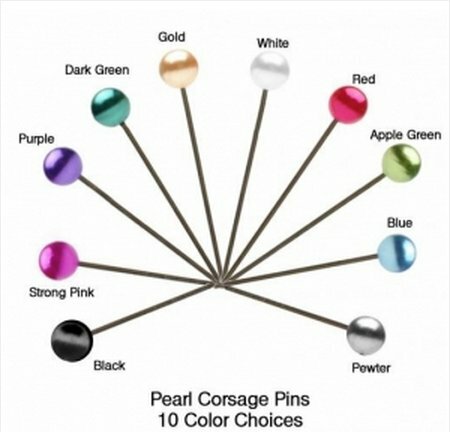 Lomey pins come in a large range of different colors - you aren't limited to just white. 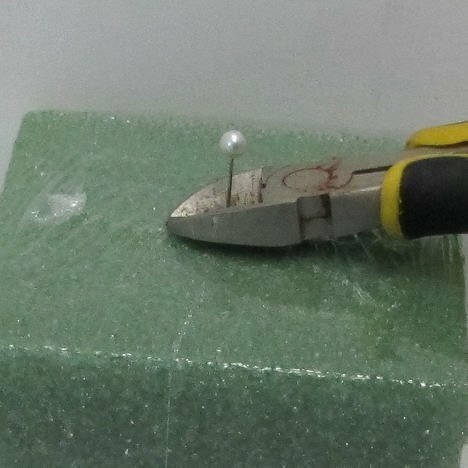 I bury the steel shank of the pin deep into a stiff styrofoam base. Use heavy wire cutters to shorten the pins to the length you desire. 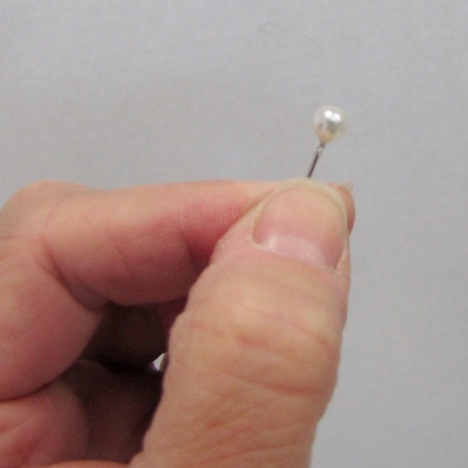 You may want to dip the pearl pin into Oasis floral adhesive to make sure it stays in place. 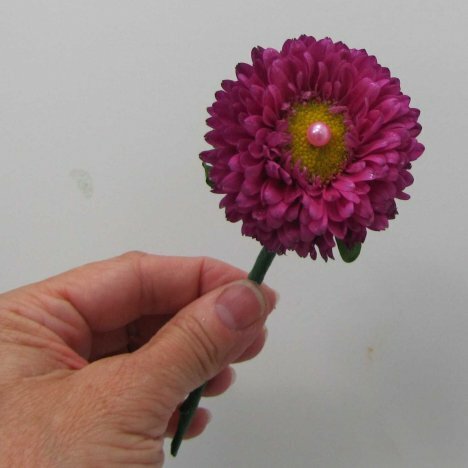 Insert the shortened pin into the center of the Aster boutonniere. Even a closeup shows that the addition a short pin conceals any mark on the flower middle and adds a dainty jeweled look to the bloom.